Following the success of previous First World War Partnership Days, you are invited to attend a free Partnership Day 2018 event at the Pierhead, Cardiff on 30 January 2018. Organisations and individuals working on First World War Centenary projects in Wales, large or small, are invited to attend. •	Discuss the commemoration in Wales so far and share Lessons Learned. 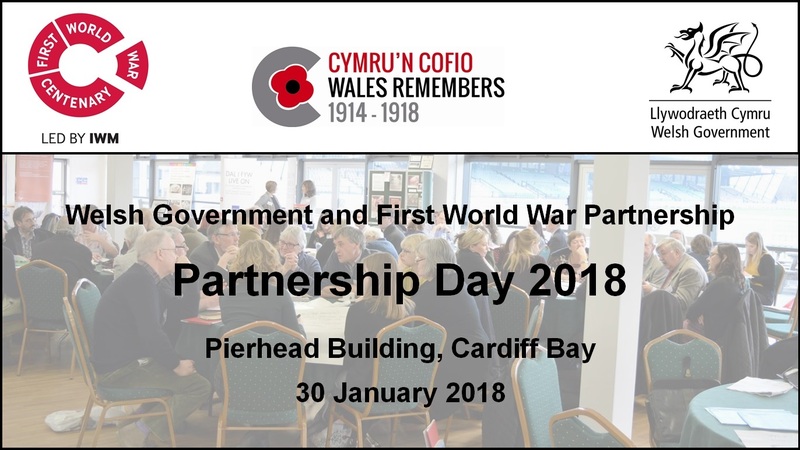 Registration is available via Eventbrite here https://www.eventbrite.co.uk/e/diwrnod-partneriaeth-2018-partnership-day-2018-tickets-41418551001 or by booking a place via email: extranet1914@iwm.org.uk with your name, organisation and any dietary requirements or access needs you might have. Places will be allocated on a first come first served basis, with spaces available for 4 delegates per organisation.